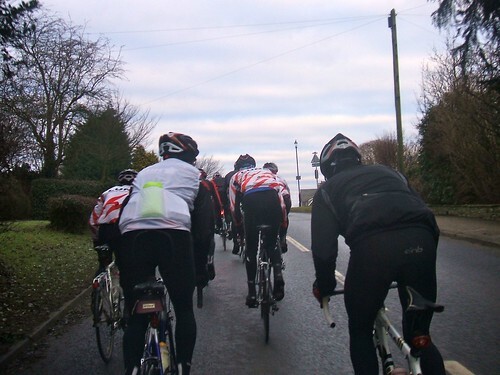 A bright and relatively mild day saw 13 Lune riders leave Dalton Square for a run up to Kirkby Lonsdale, Killington Reservoir, Sedbergh, Barbon and back via Arkholme. A steady pace was set going out to Kirkby Lonsdale where a minor detour was thrown in just to test our collective knowledge of the Kirkby Lonsdale one way system (yes it does have one!). Having got ourselves back on track the climb out toward Old Town saw the Johns, Julian and Nic out front battling it out for the honours which I think went to a John. The group joined the Old Hutton race circuit and then headed due North toward Killington Reservoir. There had been much discussion as to whether the minor roads would still be iced up and sizeable patches of ice began to appear so caution was the watch word for the next few miles. Unfortunately a monster sheet of ice was encountered which was 2” thick in places covering the entire road except for a narrow strip down the right hand side. Paulo was clearly too tempted to see if you could ride across it and applying his renowned bike handling skills to the task ventured onto the ice – but you couldn’t and he didn’t at least not for very long! And once he’d picked himself back up, thankfully unscathed, we moved along with even more caution eventually emerging onto the main road for a swift descent to Sedbergh. At Sedbergh, there were a few shouts for a café stop but momentum and critical mass pulled us past the café on toward Dent, where the welcome sight of Tinner coming in the opposite direction swelled the numbers to a less unlucky 14. The climb of the day up over to Barbon saw the usual suspects disappearing up the road and I believe Johnny took the honours on this one. An extended re-group ensued which lasted all the way down Barbondale and once back on the main road the pace picked up again with regular burst of speed being injected at regular intervals for minor hill summits and the odd sign. The sport continued all the way down to Arkholme where PB sprinted for the old village sign, the rest going for the new one a 100 metres further on and Chris “the power” Morley had a few decent goes at wrestling the Green Jersey from Julian but he’d had a pretty firm grip on it all day and so it remained. Distance 62 miles / 3hrs 30mins / 17.5mph / 1350m ascent.